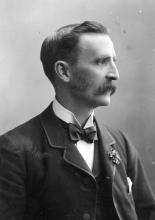 Samuel Cleland Davidson was born on 18th November 1846 , at Ballymachan Farm, Strandtown, Belfast. The family later lived at "Turf Lodge", Sydenham. He was the youngest of three sons, and was educated at the Belfast Royal Academical Institution. He served his apprenticeship with a Town Surveyor, William Hastings, C.E. In March 1864 he received an invitation from his cousin James Davidson, a tea planter in India, to go out with three other Ulstermen to help run a group of estates in which the Davidson family had acquired an interest. He started his work in India by mapping out the area for the first time. However he became interested in the methods of cultivation and production of the tea plant and its crop. He soon became an authority on the subject whose opinion was widely sought. He developed and built his own tea drier which he patented on 15th December 1877. Further refinements lead to the design of the forward bladed centrifugal fan, which was widely adopted for use in many different industries. During his lifetime he applied for over 200 patents and was granted more than 120. Samuel Davidson was awarded a KBE in 1921 but was ill and unable to attend the ceremony of the accolade. He died on 18th August 1921. More recently the Northern Bank acknowledged his achievements with a commemorative £50 bank note. Registered visitors who have logged in may also be interested in the Davidson Gallery, and the attached excerpt from his diaries.